Do your kids accumulate stuff like my child? It’s everywhere, and she’s only 2. I had a room of stuff for her before she was even born. A bouncer, an exersaucer, a little seat, a playmat the list goes on. Now as she gets older her things are migrating out of the playroom and into the garage. There’s the trike, the Cozy Coupe, the sand toys the balls! My husband and I try to not over do it on the “stuff”. I can’t remember the last toy I bought her. I do however go a little overboard on the books and craft supplies, they’re good for little minds right? But somehow the stuff keeps building up. 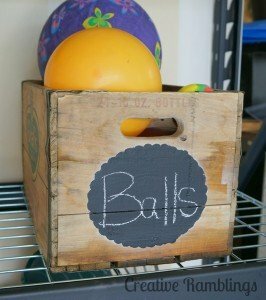 I was going through the toys in the garage this week and found 10+ balls. I’ve purchased my child 2, count them 2, balls in her lifetime. One was a baby toy that’s still inside and the other is a funky colorful one for outside. But somehow we now have many many more. Does this happen at your house? Where does all this stuff come from? Anyway, it’s here and it’s not going anywhere so might as well organize it. A couple months back we spent some time and money on good solid sturdy shelving in the garage. Shelving we can grow into. So I have the space, I just need to corral the toys. 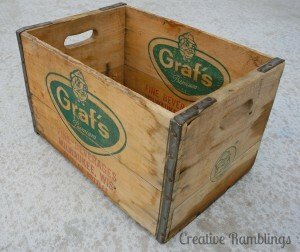 When I found this old crate I knew this was a start. 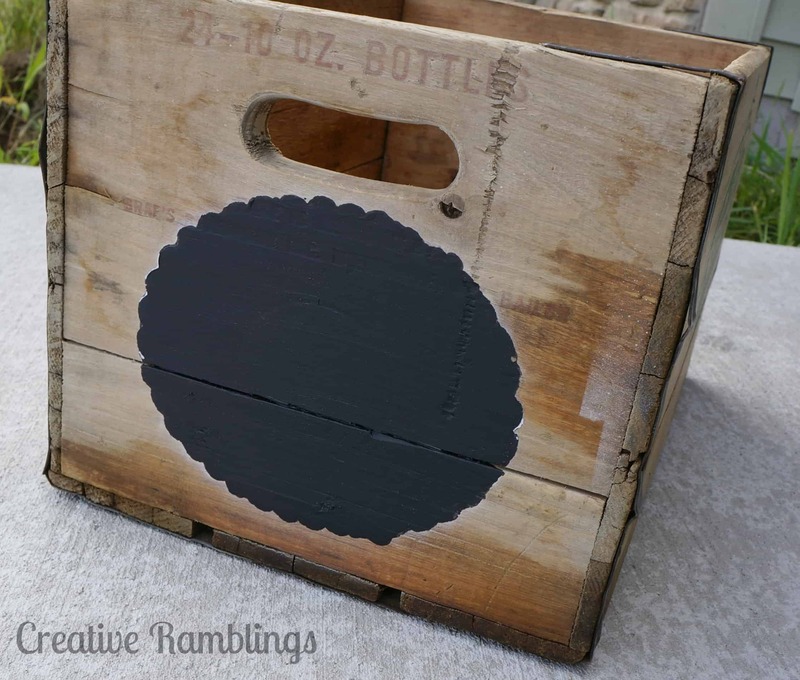 I kind of have a thing for old wooden crates (remember the soda crate makeover). I’ve found them at our local flea market for a couple bucks. 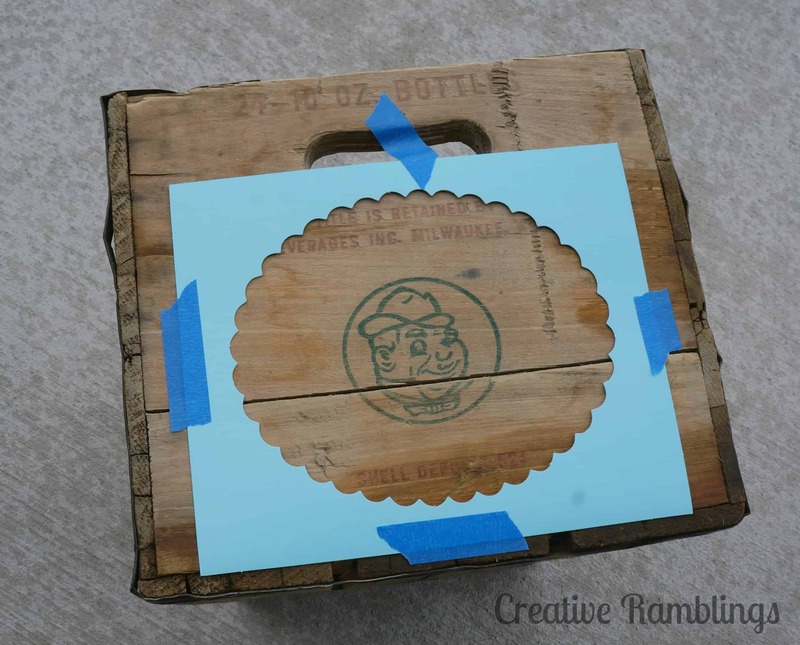 I originally wanted to use this one inside but the interior of the crate is pretty rough and short of sealing the whole thing I just decided to use it outside and leave it fairly rough. 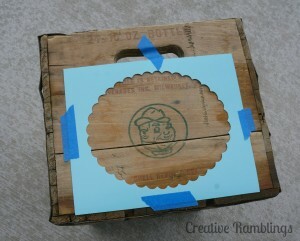 I cleaned it up with some Murphy’s Oil soap and sanded down all the rough edges. Then I used a oval shaped stencil to add some chalkboard paint to the front. So easy! 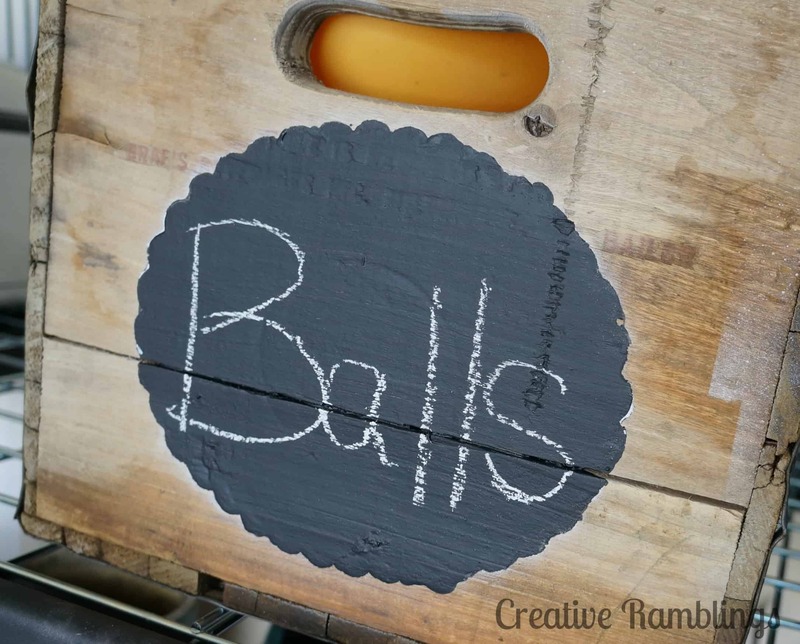 We’re currently using this one for balls. When the local flea market comes around again I’m planning on getting a few more for the other little items in our garage. May even get one for my paint supplies. The feeling I get from just a little bit of organization is so satisfying. 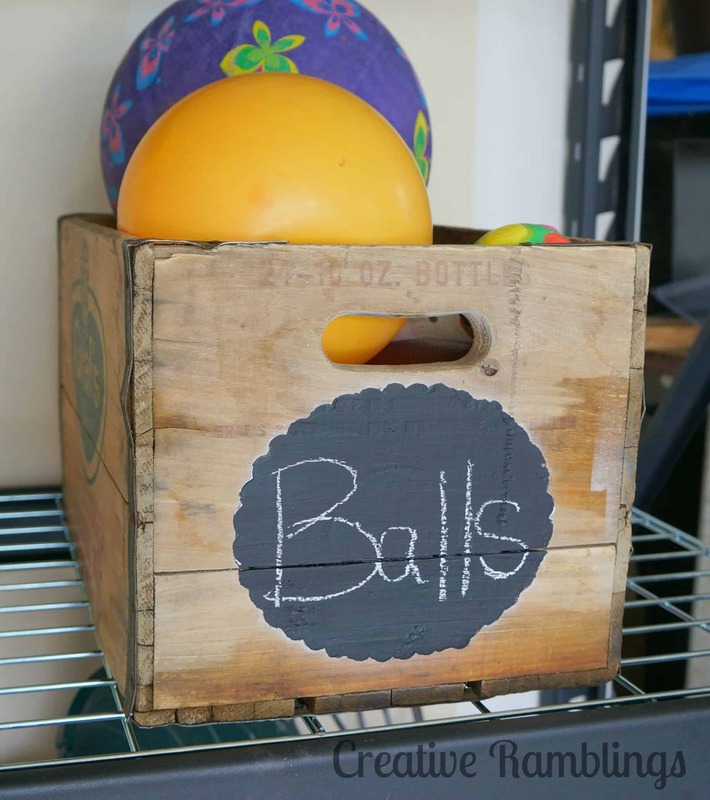 Even if it’s just 10 balls in a crate, that’s 10 less balls to trip over when I’m walking into the house. Do you have this toy/stuff problem? What’s your go to organizing solution. Do share. I have a long way to go. I love this project! Yes, I have three small children and it is amazing the amount of toys kids accumulate! Thanks Rita, glad you stopped by. Yes! We have an inordinate amount of little toys floating around… I need a nearby flea market with fabulous crates like that. 🙂 Thanks for sharing at Give Me the Goods! Oh how the little things add up 🙂 Thanks for stopping by Rachel.